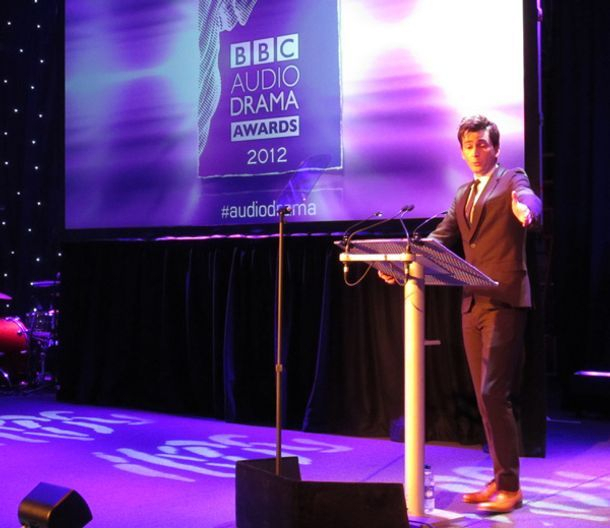 On October 24, 2011 the BBC announced the launch of the BBC Audio Drama Awards. The aim of the awards is to celebrate and recognise the cultural importance of audio drama, on air and online, and to give recognition to the actors, writers, producers, sound designers, and others who work in the genre. The list of nominees was published on January 9, 2012 and the winners were announced at a ceremony held on January 29, 2012 at the Radio Theatre in Broadcast House, London. The music for the evening was provided by The Jazz Slayers. You can listen to David's welcome below, in which he makes a joke about Drill Hall. This former venue used by the BBC for radio broadcasts with an audience is now owned by RADA. "The quality of our radio drama is one of the things that makes me proud to be British. Acting on the radio is challenging, inspiring, delicate and always a privilege. Radio drama is often overlooked and undervalued next to its showier, younger siblings on the television and in the cinema, and yet it is on the wireless that so many important and brilliant talents have been discovered and nurtured. I am delighted radio drama is being celebrated in this way, it's about time." Not only the host but a winner too! David won the Best Actor Award for his performance in Kafka The Musical. PLUS photos of the night and to hear some of David's introductions. David did such a fabulous job he was asked back to host in 2013! Here is a close up look at the actual award that the winners receive, courtesy of winner Brian Sibley. 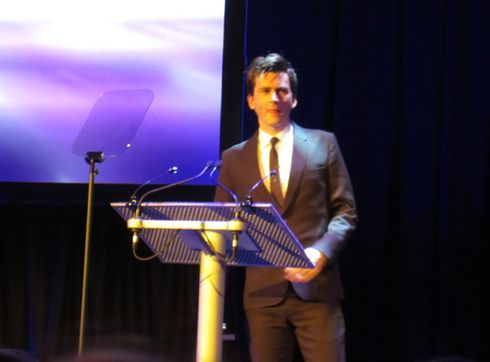 The Awards will cover audio dramas first broadcast in English in the UK between October 1, 2010 and September 30, 2011 (October 1, 2011 and October 31, 2012 for 2013) – or first uploaded/published for free listening online in the UK during the same period. Entries are welcome from all makers of audio drama, and are not restricted to BBC broadcasts. Each programme producer may enter up to three categories (one entry only per category) and there is no entry fee. The panel of judges will be taken from within and outside the BBC and each category has its own set of three judges. The Imison and Tinniswood Awards, in conjunction with the Society of Authors and The Writers' Guild of Great Britain, will also be announced at the winners' ceremony. The Imison Award was created in 1994 after the death of Richard Imison, Script Editor BBC Radio Drama 1963-91 and you can read all about it here at the Society of Authors website. The Tinniswood Award was created in 2004 after the death of Peter Tinniswood, TV and Radio author and novelist who died in 2003, and was established by the Society of Authors and the Writers' Guild of Great Britain. Click here to access the awards homepage.